A man injured in a chairlift accident at a ski area in Canada more than four years ago is taking the resort to court for damages. Crystal Mountain, West Kelowna in British Columbia, has been closed since the accident in March 2014 when a cable on the two-person Blue Chairlift came loose and four chairs fell to the ground. Lawrence Waldenberger was one of four people on the chairs that fell. In 2016 he began legal action. According to local news reports he claims he suffered traumatic brain and other head injuries and broken ribs that were caused or contributed to by negligence and breach of duty of care. The court case is to decide the amount of damages Waldenberger should receive. The official report into the accident by the BC Safety Authority found that "the primary cause of the incident was low tension within the haul rope directly caused by the counterweight being in contact with the ground within the counterweight pit." Crystal Mountain, British Columbia, has no connection with other resorts in North America with the same name. As we creep closer and closer to the winter season, the Ikon collective pass adds more ski resorts. Now Brighton and Solitude, both in Utah, will be available to ski if you have your Ikon Ski Pass. Along with a whole host of other impressive resorts also signed up to the pass or owned by Alterra Mountain Company. With the addition of Brighton and Solitude, it now makes five Utah resorts to ski this winter on the collective - Well, three for snowboarders. Certain US resorts still have a funky attitude towards snowboarding on their perfect groomers with Alta and Deer Valley in Utah being skier only hills. Though maybe this'll appeal to you?! If you're heading to ski in North America or are interested in the ski politics there, check out these previous indepth PlanetSKI reports on how the businesss works. Whilst writing the above, we've just clocked several more! Ikon Pass holders can now access all corners of the skiing in the USA, from the Pacific Northwest to the Midwest to the Northeast. Newly on board to the Ikon community is Boyne Mountain Resort, The Summit at Snoqualmie, Boyne Highlands Resort, and Cypress Mountain. East Coast skiers and riders get up to 7 days at each Ikon pass mountain - Sugarloaf Mountain, Sunday River, and Loon Mountain Resort - for a total of 21 days. Ooof, that's a lot of business going on. Keep tuned in for news on the ever expanding Ikon Collective Pass. A Briish man has died while attempting a base jump in Lauterbrunnen. The 44-year-old man crashed into a rockface on Sunday afternoon and was left hanging on a ledge. Air rescue teams were sent in but say the man had already died. Witnesses suggest the man was attempting acrobatics. The accident follows the death of another British man while base jumping in the Dolomites in June. 47- year old Robert Haggarty from Hampshire also hit a rock wall. It seems that August is the start of snow season as not only has this Wyoming resort received its first dusting, but the Alps have also had a pummelling. The Italian Dolomites and the Austrian Alps saw some serious summer snowfall over the weekend, and now it's started across the pond in the USA. Is this a sign of things to come...? Wyoming's Jackson Hole reported its first dusting this morning, and we're no doubt expecting more of this news from fellow ski resorts soon. 16-year-old Timothy Murray has died after falling during a mountain walk in north-west Scotland. He fell and suffered fatal injuries on Stac Pollaidh on Sunday. Timothy, from Brighouse in West Yorkshire, was walking with a group but it is understood he separated from the party as his fall was not witnessed by anyone. The young man was reported missing just before 4.45pm and his body was recovered by the Dundonnell Mountain Rescue Team. "Our thoughts are with Timothy's family and friends at this tragic time," a statement by Sgt Kay MacRae with Police Scotland reads. "We would like to thank our partners in Dundonnell Mountain Rescue for their assistance with this challenging incident. "A report has been submitted to the procurator fiscal, as is standard procedure with sudden deaths." A family statement issued by Police Scotland read: "It is a very sad loss and Timothy was a lovely son." It's not uncommon in Italy to still see skiers on the slopes in jeans, and a headband is still the favourite head attire, over a helmet. Last week mountaineers were shocked and reported a man hiking the Breithorn - a mountain saddling Switzerland and Italy with a 4,000m+ peak - in jeans and trainers. The climbers reported the man to Italy's National Alpine Cliff and Cave Rescue Corps (CNSAS) and claimed it was more like bumping into someone taking a city stroll rather than tackling the challenging peak. The mountaineers advised the man to turn back but he continued. "Mountains are extraordinary places, but they're not a city park or sandy beach," CNSAS wrote in a post shared by thousands of Facebook users. Almost 5,000 people have had their say about how Britain's elite winter and summer athletes should be funded in future. UK Sport launched its public consultation in June to help decide how it should invest in the future to inspire the nation through elite sporting success. It asked for views on how to allocate taxpayer and National Lottery funding following the 2020 Olympic and Paralympic Games in Tokyo. At the end of the 11-week consultation process, UK Sport had received 4,923 responses. The last time a similar consultation took place in 2014 there were only 924. The responses will be now be analysed by consultation agencies and compiled in a report for the UK Sport Board. The Board will decide the future funding strategy by early 2019 when the report will also be published. It will come into effect from April 2021. The new strategy will come into effect for winter sports after the Beijing 2022 Olympics. "We are delighted that there has been a significant response to our Public Consultation, which demonstrates real interest in Olympic and Paralympic sport in the UK as well as its future direction. "As an investor of significant public funds in elite sport, it is right that UK Sport should check in with the general public to ask whether you want us to continue aiming to inspire the nation through medal success and whether we should change our focus in any way." A drone lost in the snow five months ago during the good winter season in Scotland has been recovered. The drone disappeared during a search on Ben Nevis. Not only has it finally been found but has been recovered from its frozen state and is back in use. The Lochaber Mountain Rescue Team uses drones for search and rescue operations when weather permits. The rescue team claims to use a "squadron" of drones for its work in the mountains, with one used just this week just under 1000m in Gearanach in a potential rescue of someone using a parasail. Other incidents involve the rescue of a walker with an injured ankle on Ben Nevis, and another hiker with an ankle injury at Steall Falls. Kranjska Gora in Slovenia and Sella Nevea in Italy will jointly host the next World Para Alpine Skiing Championships to take place this coming winter. The technical events (slalom and giant slalom) will take place in Kranjska Gora. The speed events (downhill and super-G and the super combined) will be held in Sella Nevea. The two cities are located on the border between Italy and Slovenia and are just 35 kilometres apart. The championships take place from 21st January to 2nd February. "We are extremely happy to announce Kranjska Gora and Sella Nevea as the host cities for the next World Championships," said Dimitrije Lazarovski, Head of World Para Snow Sports. "These are places with a long experience of hosting para alpine skiing competitions and skiers are familiar with them." There will be a total of 30 medal events in the World Championships, 12 in technical events and 18 in speed competitions. Obersaxen in Switzerland, was scheduled to host the event but withdrew in April. The last edition of the World Championships took place in Tarvisio, Italy, in January 2017. Great Britain's Millie Knight and her guide Brett Wild won gold in the visually-impaired downhill in Tarvisio and will be looking to defend their title, while teammates Menna Fitzpatrick and Jen Kehoe will go into the championships as the reigning Paralympic champions in the visually-impaired slalom. It featured on the cover of National Geographic as one of the magazine's destinations of a lifetime. Now the world-famous Äscher restaurant is looking for new tenants. The restaurant on the edge of a cliff above Wasserauen is reached by cable car and a short walk. It has been run by members of the Knechtle family for 31 years. The current managers, Nicole and Bernhard Knechtle-Fritsche, who took over in 2014, are moving on at the end of October when it closes for the season. Their decision was announced in a statement on the Apenzzell Innerhoden Canton website, which said the inn had experienced a great boom, attracting visitors from Switzerland and around the world during the "Knetchtle era". It said a new lease would be advertised soon. The news website, The Local Switzerland, says there have been concerns at the number of visitors since the rise in popularity, which followed prominent publicity and posts on social media . In 2014 it was named one of the 5 most interesting restaurants in the world by the Huffington Post and the actor Ashton Kutcher posted a much-shared link about the inn on Facebook. Oppoents of a bid by Calgary to host the 2026 Winter Olympics and Paralympics claim that 75% of city residents are concerned about the potential costs and risks. The NoCalgaryOlympics group says a new survey by the City of Calgary found only 25 per cent of the 500 people questioned had no concerns about the bid. "The majority, or 75 per cent, cited concerns for costs, taxes, funding sources, and risks, with these concerns shared by both supporters and opposition to hosting the International Olympic Committee in 2026," the group says in a press release. A referendum to decide whether the Canadian city, which held the Winter Olympics in 1988, should go ahead with bid, is due to take place on 13th November. Other bid cities have pulled out either after losing referendum votes or because of a lack of public or political support. More Trouble Ahead For 2026 Olympic Bid? NoCalgaryOlympics claims there's no information about the cost of hosting the Games. "Calgarians want more information, particularly about costs, before they make a decision," it says. Calgary is one of five remaining bidders for 2026 still standing. The others are Stockholm in Sweden, Erzurum in Turkey, Sapporo in Japan and a joint Italian bid by Milan, Turin and Cortina d'Ampezzo. The Italian bid is not without its critics, including officials in the cities involved, as we have reported below (see entry for Monday 13th August). Last week hikers discovered 19 elks uncovered by melting snow. The elk were found after snow and ice melted by No Name Lake and Broken Top mountain peak in Oregon, USA. It's likely that the elk were caught in an avalanche during the winter 2016/2017 due to the intense amount of snowfall during the season before last. It's not common for elk to get caught in avalanches. The bodies of the elk, which are contorted by the old avalanche, are being removed after the snow melts and area is cleared. Turoa ski field's fastest and highest lift is out of action for the rest of the season after suffering serious damage in a large avalanche last week. We reported on the avalanche in New Zealand below in News in Brief - see earlier post dated 9th August. In a statement, Ruapehu Alpine Lifts chief Ross Copland said the haul ropes on the High Noon Express were unsafe to operate. "A detailed report by wire rope experts has been peer reviewed by both the rope and lift manufacturer. Regrettably RAL has been advised that the haul rope is unsafe to operate. A range of repair solutions were explored in detail over the past 48 hours but none of the options gave us certainty that the lift would open again this season. Its been a tough few weeks for the crew but the snow is still falling and we know you how much you love this amazing place - see you here for a shred real soon." Due to the High Noon express being out for the season, Turoa ski fields will be changing the layout of their parks over the next week or so to suit the Giant chairlift. In an earlier video Ross Copland highlights some of the damage to the chairlift. US ski and snowboard manufacturers are likely to lose the expanding and potentially lucrative Chinese market, according to trade analysts. The Chinese daily, The Global Times is reporting that American businesses will be hit by the China-US trade row, damaging their prospects at a time that interest in snowsports is rising rapidly in China. The country will host the 2022 Winter Olympics and is one of the few places in the world where the numbers of skiers and snowboarders skiing is growing. The Chinese government's ambition is to get 300 million people participating in winter sports by 2022. A second giant indoor snow centre is being planned and is due to open in June 2019. China has responded to the imposition of US tariffs on Chinese goods by announcing its own tariffs of 25 per cent on US ski clothing and boots and 20 per cent on skis, bindings and other equipment. Analysts say the increased costs will make the American goods too expensive. A sales manager working in a ski resort in Harbin in northeast China told The Global Times that he would not be buying American goods. "We were considering replacing our old Austrian-made snowboards with US ones. But given the current US-China trade war, we will give up buying US ski products to show our patriotism," he said. The Global Times is a Chinese daily with a version in the English language. The Mayor of Milan, one of the three cities involved in a joint Italian bid to host the 2026 Winter Olympics, has called it a "botched solution". Giuseppe Sala says the city will remain part of the bid but will "not allow Milan's dignity to be trampled upon". Sala has claimed in an interview with RAI13 that the Italian Olympic Committee CONI originally gave its support to Milan as the bidding city before changing its mind and opting for a joint bid with Turin and Cortina d'Ampezzo. Turin's mayor has also been critical of the joint plan. A meeting of the Mayors of the three cities to discuss the bid will take place next month. The 2022 Games needs its mascots and the International Olympic Committee has launched a worldwide design contest. "Join the design competition to find the mascot of the 2022 Olympic Winter Games," said the IOC President Thomas Bach in a video message. "We trust that you will produce a fun mascot which will fascinate people around the globe and will be a great example for sports, and winter sports in particular." The competition was officially launched at an event held to mark 10 years since the Beijing Summer Olympics began in 2008. The winning design will be chosen next year once the submissions have been reviewed. Breckenridge and Keystone are targeting Friday November 9th. Copper is aiming for Friday November 16th. Other resorts are yet to announce their dates. The earliest resort to open a significant slope in both in the USA and Colorado this autumn, is once again likely be Arapahoe Basin or Loveland. They have an annual battle to see who can be first to open. A tourism official in the upmarket Swiss ski town of Davos has reportedly complained about the behaviour of some Orthodox Jews who are regular visitors to the Swiss resort in the summer. Reto Branschi wrote a letter to the local Jewish community leader Rafi Mosbacher who had it translated into Hebrew and Yiddish. The translation has been posted on noticeboards at hotels. According to the Südostschweiz news website there have been complaints that nappies and other waste have been left behind in the forest and that playgrounds have been taken up by large groups, leaving no room for small families. During two tours of a cheese factory in 2017 and 2018, "Jewish guests held their noses, disturbing some of the other participants." It's also alleged that the high number of reports of lost guest cards, which give free use of the cable cars, "could indicate an abuse". The website says the Swiss Federation of Jewish Communities supports the actions of the Davos official. "These are facts," the Secretary-General Jonathan Kreutner has reportedly said of the complaints. Davos is popular summer holiday destination for Charedi Orthodox Jews. The Mountain Collective Pass is adding resorts in Japan and Montana to its offerings for the 2018-19 season, it was announced on Tuesday. The pass, which includes Aspen Skiing Co, is adding Big Sky Resort in Montana and the Niseko United Resort in northern Japan. It is available for $499 and offers two free days at each partner resort and 50 percent off after that. The force of an avalanche at Tūroa ski field has severely damaged one of the towers on a chairlift. Repair work is under way, but the chairlift may need to be closed for the rest of the ski season. In a comment on Facebook, they said: "Today the team working on site will pull the tower back into an upright position to allow the rope to turn. Two diggers arrived on site last night and the Doppelmayr team are installing rigging equipment. Once the tower is upright the chairs will be put back into the storage garage at the drive station. Work is now underway fabricating a new tower to replace the damaged one"
The group head of sales of three major ski operators - Inghams, Ski Total and Esprit Ski - is moving on. Simon McIntyre is joining the online travel agent Iglu, which specialises is ski and cruise holidays, in the newly-created role of General Manager, Ski. He'll be responsible for sales, marketing and commercial. He's been with Hotelplan, the parent company of the three ski tour operators, for nine years. Richard Downs, Iglu chief executive commented: “We’re very excited to welcome Simon into this role as we strengthen our partnership with suppliers and drive the business forward." The USA's west is experiencing catastrophic wildfires. California has two raging that are among the worst in state history. Firefighters are spread so thin that crews from Australia and New Zealand have been flown in to assist. Meanwhile Donald Trump has piped up on California's fires and of course gets it so wrong. He's notorious for his contrary view on climate change and we wouldn't consider him an environmental expert. Experts have said they have no idea what he means, regarding water being diverted into the Pacific Ocean. A World War Two plane on a sightseeing flight crashed into a mountainside in eastern Switzerland at the weekend. The Junkers JU-52 HB-HOT was carrying 17 passengers and three crew. It was returning to Zurich from a two-day trip to in Locarno on southern Switzerland. A witness said it fell like a stone out of the sky. The aircraft crashed at 2,540m on the western side of the Piz Segnas 3,000m. The bodies are being recovered and an investigation has been launched. The Loveland Ski Area in Colorado, USA, has run a competition to name its new high-speed lift. And the winning name is..... "Chet's Dream". It is named after Chester R. (Chet) Upham, Jr. who was one of the early pioneers at the resort. "Chet became a partner in Loveland Ski Tow Company in 1956 and immediately convinced the other partners it was time to install what would be Loveland's first chairlift and only the third such lift in Colorado, Lift 1," said a statement from the resort. "While a major force in the formative years from 1956, it was when Chet bought out the other partners in 1972 that the true potential for Loveland was realized. From that day forward, the Upham Family has owned and operated Loveland Ski Area." The name was picked from 3,000 entries. Bulgaria's Supreme Administrative Court has blocked plans that could have led to another ski lift being built in the Bansko ski resort. A three-judge panel of the Court has overturned the government's planned changes to the Pirin National Park management plan, adopted late last year, on the grounds that they breach the country's environmental protection laws. According to The Sofia Globe, the changes were widely seen as opening the way for the construction of a second main ski lift from the town of Bansko, and were supported by local residents. But the plans were successfully challenged by environmental groups which feared over-development of the Pirin mountain range - a UNESCO world heritage site. 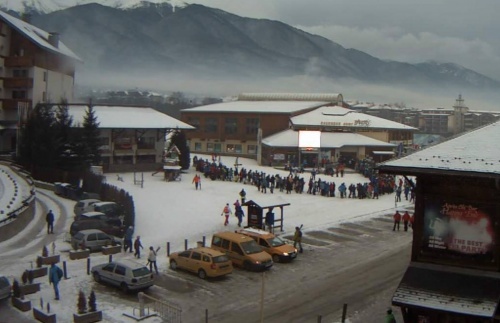 The government says the Bansko ski area covers only two per cent of the national park. It can appeal against the Court's decision. If it does, a panel of five judges of the Supreme Administrative Court will consider the case. Switzerland is not always the first choice for British snowsports fans, thanks to punishing exchange rates and generally high costs. So it makes a change to report some good news. More British skiers and snowboarders stayed in Switzerland last winter than the previous year. Our friends at Switzerland Tourism tell us that UK overnight stays in Swiss hotels were up by 3.3% in the winter season 2017/18. And for the period January to May 2018, UK hotel overnights were up by 3.4%. "The growth shows the continued demand for the alpine country - despite fluctuations in currency exchange and Brexit talks," they say. "All in all, Switzerland experienced an increase of hotel overnights of 4.6% over the winter season and a growth in arrivals of 5.1%."